My task here is to briefly explain the actual usage and installation procedures of PasturePro Posts. 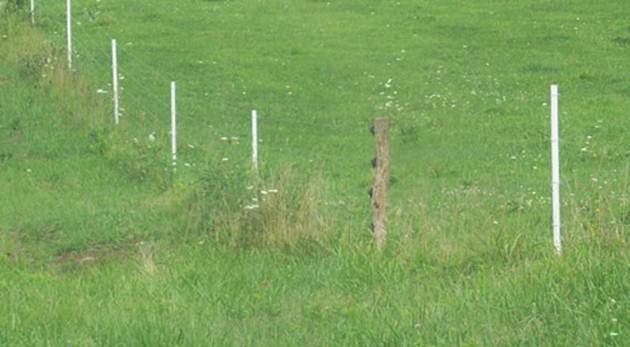 The PasturePro Post is intended to be used as a line post for electric fencing. So what does that mean? First, disregard all the posts you have used in the past. Below are some thoughts to help open your mind about line posts for high-tensile electric fencing. 12½ gauge high-tensile wire has memory capability to maintain the initial tension. It will stretch up to approximately 2% of its length, then return to its normal tension. It is springy and bouncy once it is installed. It has a breaking strength of 1,100 to 1,500 pounds. 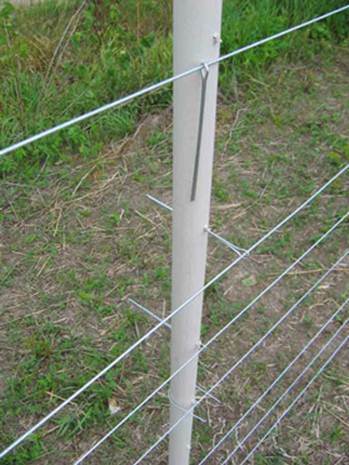 An electric fence line post should be forgiving enough to allow the high-tensile wire to react to pressure as it is intended to. Now, why do we so often attach an electric fence wire to an insulator on a rigid steel post? We are not allowing the wire to react to pressure as it is intended, and when pressure is applied, such as deer traffic or a tree falling on the fence, something is going to break. It probably is't going to be the wire or the post. You will likely have a broken insulator. The electric wire will then be resting directly on the steel post and you have a short. When you get time, you will have to walk to find it. Does a PasturePro Post stop this problem? It certainly does. Based on the above example, a PasturePro Post is flexible enough to bend with the pressure, then spring back to its original position. With the added tension of the wire, it will spring back even more so. The PasturePro Post does not require insulators, as the post itself is insulated. And, most importantly, it allows the 12½ gauge high-tensile wire to react as it is intended to. High-tensile wire stretches, then returns to its initial tension. The PasturePro Post does much the same. The post and the wire work together in unison, and that is the beauty of this marriage of products. OK, now that I've given you my sales pitch, here are some suggestions to use as guidelines for installing PasturePro Posts. A PasturePro Post has good ground holding power, meaning that it seems to stay where you put it, without much lift out. We provide a lot of posts for single strand cross fences. The 4′ PasturePro Post is more than adequate for this fence. If you are going to put up multiple strands, then a 5′ PasturePro Post will be adequate for up to 5 strands, and a 6′ PasturePro Post works for situations where you have 5 or more strands and want the top wire around 4′ above the ground. 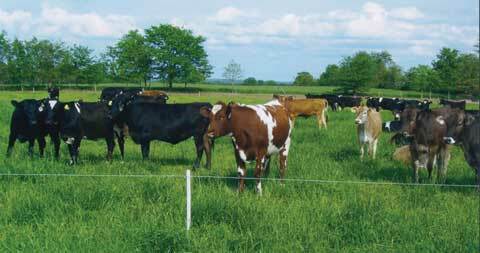 Our basic post product is the PasturePro Post that is available in 4′, 4½′, 5′, 5½′, and 6′. We also offer Line Boss Posts. These have a larger diameter and are more rigid. Some people just like the thicker look and feel of them. We also recommend the Line Boss Post for installations of electrified high-tensile woven wire. These are available in 6′, 7′, and 8′ lengths. Use the Line Boss Posts for areas where crowding may occur or just for aesthetics. Initially, we did't think we would sell all that many larger diameter posts, but they have pleasantly surprised us. I have personally used a lot of them on my own farm for perimeter fences, and I love them. They are more rigid, and I just like the way they look. I guess there are many other people who think the same way. Most of the rope types of equine fences have been using the Line Boss Posts. They are a little more visible, just by the nature of their larger diameter. We have also introduced the PasturePro Droppers, which are basically fence stays. They have a smaller diameter and are not intended to be driven into the ground. They sit on top and their prime function is to maintain wire spacing. Generally, post spacing will range from 20' to 50', depending upon slope and lay of the land. In most level areas, 40' to 50' is a good distance. Out west you will see spacing of 100' or more. The closer your spacing, the more visible your fence will be. So if aesthetics are important to you, and you want the fence to look more "fency", then narrow your spacing. A mix of wood posts and PasturePro Posts makes for a strong and appealing fence. 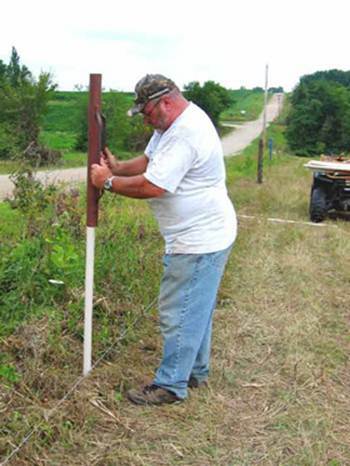 In this case, you could put 4″ to 5″ diameter wood posts every 300' to 400', then use 6 to 8 PasturePro Posts between. This will give you a strong, attractive, and effective electric fence with very little maintenance requirements over its lifetime. We feel that you can drive a PasturePro Post anywhere that you can drive a steel t-post. A standard manual post driver is all you need. A pilot driver (pictured above on right) does come in handy when you are in very hard or rocky soils. Our recommendation is to try one if you are having problems getting the posts in straight and plumb. 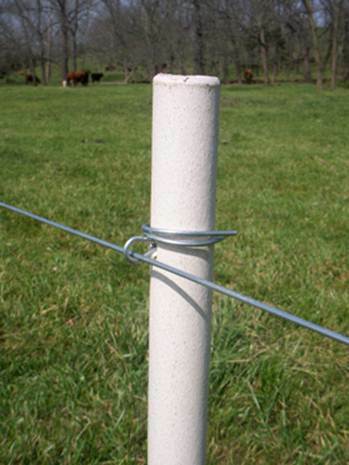 We love the flexible nature of PasturePro Posts, however this flexible nature also means that when you hit rocks, the posts will want to flex and turn off the rock, giving you a post that isn't plumb. Now, for a cattleman that is putting in a single wire cross fence that may not be important. They may just want a post to do its job, if it leans or flexes a little, so what. Personally, I am somewhat picky about sighting down my fence and seeing all the posts in line, so I like using the pilot driver. If you pilot a plumb, straight hole, your post will stand true. Once the wire is attached and tensioned, it will help align the few that may be a bit out of line. The pilot driver is somewhat heavy to lug around, but it sure is an improvement over the alternatives in rocky hard soils. Additional note: this pilot driver is not just for PasturePro Posts. We have used it on various other kinds of posts as well &dash; with favorable results. We feel that 12" of ground penetration is enough for a 4′ post for single wire cross fences. As post height increases and the number of wires that will be attached to the post increases, so should the ground penetration for the post. On a 6′ post, with 5 or more strands of high-tensile wire attached, then 18" of ground penetration would be more acceptable. We sell the PasturePro Post to many different geographic locations and get feedback from our customers regarding how far the post should be driven into the ground. That feedback varies from different locations, as it should. If you are located in sandy western soil, such as the Sand Hills of Western Nebraska, and need more stability, then go with your personal feelings. You probably know your soil better than we do. So what we are saying here is this, if we say that 12" of ground penetration on a 4′ post works well here in the Ozarks, and you know personally that a 4½′ or 5′ post would be better for your soil types, then go with your gut. What probably works the best in this industry is to take the basic recommendations and input from your own personal experiences and knowledge, and adapt it to your own location. Please just use common sense at transitions, dips, and ridges. Remember, we are calling the PasturePro Post a line post, and it serves that purpose wonderfully. Just as in any type of fence, at bends, transitions, severe ridges, and dips, you may need a stiffer post. We recommend using a wood post in places where you will be having extreme pulls in either vertical or horizontal directions. In going over hills or severe ridges, it may be prudent to just plant a good wood post at the ridge top. I've noticed that when I do not get that ridge post exactly in line, it will bend horizontally with the wire pressure when you tension up the wire. So, I recommend using a wood post in this situation when you are building fence over lots of hills. We get a lot of calls about pre-drilling the posts, so that prompts me to address the issue of drilling the posts. Let's talk a little about the drilling procedure. 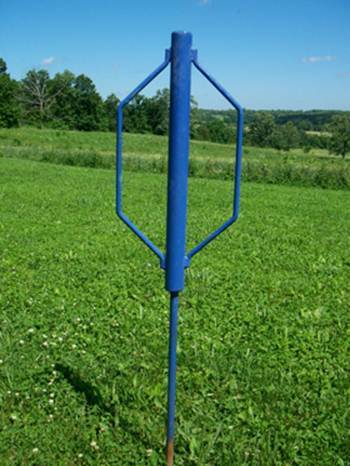 We recommend that you field drill PasturePro Posts after they are driven in the ground. They drill quite easily with a standard cordless drill. When driven, the posts are very hard to turn, so if you pre-drill them and then get off when driving them, your cotter pins will not be square with the fence and cause you some problems. The cotter pin we provide is 13-gauge, class-three galvanized pin. You want to drill a hole that just allows the pin to go through. Do NOT oversize the hole. A 7/32" or 3/16" hole is adequate, so please don't drill a larger hole. If you have some 10 to 12 gauge cotter pins on hand, please just keep them for other uses, and do not use them on PasturePro Posts. You will likely be taking out more material than necessary and if you drill a hole through any rod material, it will weaken it at that point. We have had no problems with the 13 gauge cotter pins that we provide and highly recommend using them. Due to the flexible nature of these posts, we do not feel that a larger cotter pin will give you any more strength. Making your own cotter pins out of 12½ gauge high-tensile wire? That would be acceptable. My ol' friend Willy Kilmer has done this for years. He calls his a diaper-pin knot. In this case, you will only need to drill a small hole to allow a single 12½ gauge wire to pass through. Just remember to not lock the fence wire in place. Make a loose knot to allow free travel of the fence wire. I have done this before but personally prefer the manufactured cotter pins as my hands get weary after working with the stiffer high-tensile wire, and making and installing cotter pins all day (maybe that's a sign of my age). To me, the pins we provide are easy to work with and too cheap to make me want to make my own! Cotter pins are used to attach the wire to the post. In the photo below, you can see that the tails of the cotter pin are wrapped around the post and not around the wire. If you do bring the cotter pin tail back around the wire, do not cinch it up tight. This is to make sure that the fence wire has free travel through the pin. We have observed that it often does get cinched up too tight and when the post bends with pressure from tree limbs, wildlife, etc., the binding of the wire in the cotter pin does not allow for the post to return upright. We hope the above guidelines are helpful to you, and if you have any specific questions or comments, please feel free to call us anytime at 1-800-KENCOVE. We appreciate any feedback &dash; good or bad &dash; you may offer us.